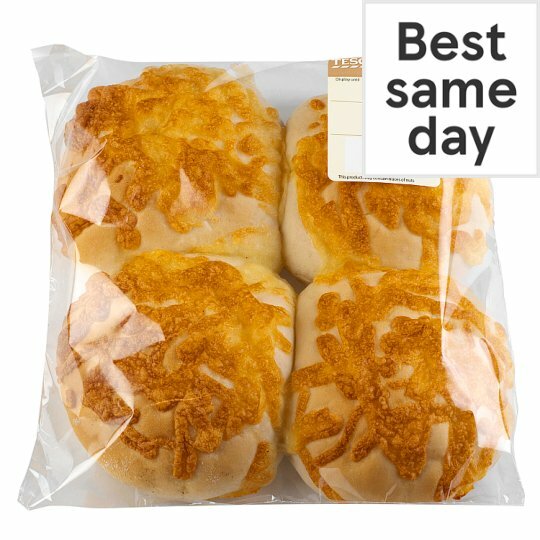 4 Cheese topped baps. Baked for a soft and light texture, sprinkled with Cheddar for a distinctive flavour. INGREDIENTS: Wheat Flour [Wheat Flour, Calcium Carbonate, Iron, Niacin, Thiamin], Water, Cheddar Cheese (Milk) (15%), Yeast, Salt, Dextrose, Palm Oil, Enzymes, Flour Treatment Agent (Ascorbic Acid).